What is in the Great Garden Formula? 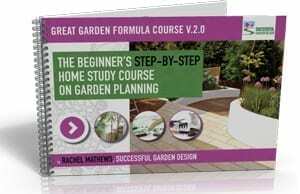 In this first module we look at the foundation of creating a beautiful garden. The 7 most important design principles (one of which creates 60% of the results) – understanding these is the vital first step to your dream garden. You will learn how each principle works and how to use them in conjunction with one another, which is critical to successfully transforming any garden. Once you know what the principles of garden design are, it’s now time to discover some niffty tricks professional designers use. Here’s where you’ll learn some simple but highly effective ‘Ninja’ tricks that help make professional designers look so talented! In this module you’ll learn how everything in the previous two modules applies to different size and shape gardens. Long narrow gardens, wide gardens, L-shaped, awkward shapes, large gardens, small gardens all have different requirements. By the end of this module, no matter what size or shape of garden you have, you’ll know how to use its shape to your advantage. The 7 main course videos are found in Module 3, are vital to watch – the 1st video is on design tricks and secrets to correctly designing a square shaped garden. There are 3 videos on how different ways to tackle long, narrow and rectangular gardens. Two videos cover how to design gardens that are wider than long. And finally a video on how to easily design gardens that are an awkward shape with angled boundaries. Included with access to the Great Garden Formula is Rachel’s interview with author and award winning garden designer David Stevens. David has written 22 books and won 11 gold medals for his show gardens at the RHS Chelsea Flower Show (the gardening equivalent of Wimbledon!). He’s done TV appearances on BBC Gardener’s World programme as well as running his full-time design business. In the interview Rachel asks David to reveal all his top tips for anyone starting to learn design and he offers advice on how to over come obstacles with landscaping your garden. If you were to hire Rachel, or another good designer, to come out and design your garden, the cost would be over four times the cost of the course. So, it’s exceptional value because you will have a new skill that you can use every time you move house and have a new garden to develop.